Kerins says at the outset that a few years ago it was customary to begin any book on film sound by stating that it was an area that had been largely ignored, but that now with the work of authors such as Rick Altman and Michel Chion, we can thankfully no longer get away with that claim. What has changed (and what makes this book especially valuable) is that analyses of sound have tended to centre on earlier technological formations such as the introduction of synchronised sound at the end of the 1920s or stereo sound in the 1950s. Sound systems have changed radically with the introduction of digital formats and multi-channel theatre and home systems. This book concerns itself centrally with digital surround sound (DSS) systems, and the bulk of it will be extremely important for those concerned with the link between technology and the poetics of contemporary filmmaking. The book has grown out of Kerins’ postgraduate work and the comprehensiveness of its research and the clarity of organisation are exemplary. He begins by laying out his research question (How has digital surround sound affected the cinema?) and structuring his answers into three categories: effects on production practices, cinema aesthetics, and finally, the implications of all this for film theory. In proposing answers to his questions, he makes some large claims for the effects of those sound systems on our conception of contemporary cinema. Kerins begins with a detailed narrative of different multi-channel sound systems in the American cinema and he has some very useful things to say about technological history. The key point is that a teleological narrative based simply on technological advancement does not get you very far. The successful implementation of new sound technologies can only be fully explained by reference to factors such as the exhibition sector and audience response. The diffusion of new sound systems has always depended on the willingness of exhibitors to implement them gradually, so cost and backwards compatibility are vital explanatory factors. To support the costs of implementation, exhibitors have to see added value, and hence consumers need to recognise the additional value. New technologies are not implemented unilaterally at a single moment and thus, they need to take account of prior systems. 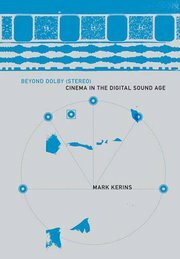 Kerins makes out a convincing case that Dolby Stereo was in many ways inferior to other sound systems, but it became successful because it was backwards compatible (you could still play optical sounds prints in cinemas in Dolby-equipped prints) and because it quickly became associated with the Hollywood blockbusters of the mid to late 1970s. What are the salient factors involved in DSS? They include enhanced dynamic range and frequency response, but the big one is the ability to separate sounds to six discrete channels (three in the front, a low frequency effects channel, and two surround channels in the rear). The breakthrough of DSS systems over preceding ones such as Dolby Stereo is that sound elements can now be placed in any of these channels on an on-going basis throughout a film and can be readily panned from one to another in the sound mix. The book is rich with detailed examples of the uses of multi-channel sound mixing in a variety of recent Hollywood films. He shows us how to listen to the sound designs that are specific to the recent past. These examples are further supported by extensive interviews with a wide range of Hollywood sound editors, designers and mixers. It is a welcome development to see film academics beginning to engage with filmmakers once more, given that the question of how filmmakers approach their craft has been a something that academics have too often ignored in favour of delving straight into their unconscious, or ideological, motivations. The most contentious claim that Kerins makes is that DSS marks a fundamental shift in Hollywood cinema. The way that others have formulated this type of claim in the past involves the notion of a “post-classical” phase of Hollywood production in which narrative has taken a back seat to spectacle. Kerins is much smarter than that. He convincingly demonstrates that DSS soundtracks aim at providing greater narrative redundancy. As cutting rates have increased, sounds are placed in different speakers that help us to construct a coherent narrative space. A cut to a completely new space, for example, might shift an off-screen sound element to left or right speakers in order to help us connect this new space to our existing cognitive map of the scene’s space. Kerins claims that DSS soundtracks “can accurately place all the sounds of a space (ambient or otherwise) in their proper locations, taking the burden of explaining spatial relationships off the visuals” (95). This allows for closer framing, more quick cutting, and – and here’s the kicker -an increasing tendency to ignore the longstanding conventions of the continuity editing system such as 180 degree space and the axis of action. If, like me, you haven’t noticed more jump-cutting recently, Kerins predicts that you will as filmmakers begin to embrace the potential inherent in the technology (122). The author coins the term ultrafield (an extension of the term superfield that Michel Chion used to describe Dolby Stereo) to refer to the new form of sound-derived spatial configuration associated with DSS. The enhanced use of the two surround channels plays an increasingly central role as Kerins’ theorising escalates throughout the book. The surrounds, placed at the sides and rear, mean that the narrative space now leaps off the screen and extends to the whole of the cinema auditorium. The spectator is now enmeshed inside the space rather than outside watching it on the screen. Spectatorial engagement is described as “immersive,” which Kerins initially designates as a spatial relationship, and not “emotional or narrative involvement” (130), although it will provide the basis for some larger theoretical claims that the author makes when he shifts the terrain to psychoanalytical theory. A few pages later, he claims that the soundtrack now convinces spectators “that they are really, physically there” (134). While it is easy to generalise about contemporary Hollywood, Kerins seems to designate a spatial, stylistic and epistemological shift so fundamental to Hollywood filmmaking and spectatorial experience that we surely ought to have noticed. However, as I look around me at the multiplex, people still seem to be consuming films in more or less the same ways. While Kerins is open to the charge that he overvalues the nature of changes in recent filmmaking (many filmmakers ignore the potential of DSS sound by keeping all the sound in the front channels, and many of us still consume films in non-DSS, or badly maintained DSS, environments), I suspect he also undervalues the ways that filmmakers of earlier periods have employed dynamic techniques such as off-screen sound, reverse field cutting and eyeline matching to give the impression of an expanded diegetic space that similarly engages spectators in the illusion of a volumetric narrative space. It also seems to me that the links between spatial engagement and spectators’ belief states are a rather more complex matter. To put all the high cards in the hand of the soundtrack is as potentially misleading as to ignore sound altogether. The final chapters of the book involve three theoretical excursions that attempt to link this work to other theorising that Kerins brands as currently being “out of fashion.” Frankly, the assumption linking film theory to fashion is a sorry indictment of our field in the way it (alas, too often correctly) proposes that theories rise and fall because of trendiness rather than other factors such as internal coherence, the existence of competing and more complete theories, and the ability to answer important questions. I’d like to think that Lacanian psychoanalysis did not simply fall out of fashion, and that we didn’t all just tiptoe away from it to start “doing cultural studies”, but rather that it declined because it was prey to significant questions on all the fronts I’ve mentioned. Kerins’ theoretical work is modest and limited in scope, taking an idea from each of Chion, Baudry, and Žižek and attempting to graft the ultrafield to it in order to see if it helps. In the process, there are significant problems of methodology, internal coherence and theoretical relevance. Each chapter uses a single film as an example that has to demonstrate the usefulness of the theorising, generally through being seen as an allegory of the theory. Chion’s acousmêtre is revived, and the Brad Pitt figure in Fight Club is seen as an instantiation of it, because he displays Chion’s “four powers of the acousmêtre: the ability to be everywhere, to see all, to know all, and to have complete power” (270). This is little like saying that if a dog has four legs and a tail, then anything with four legs and a tail is a dog. Perhaps my problem here is with Žižek, but this seems like a standard description of modernism we might expect from Clement Greenberg. Kerins, however, goes to illustrate the claim through the famous example of the beach landing from Saving Private Ryan (USA 1998) in which he states that style renders “not the actual battle itself but the soldiers’ fear and confusion” (303). This observation is not centrally concerned with form at all, but rather the inner states of the characters within the diegesis. These complaints are perhaps an overstatement of my problems with a book from which I learned a great deal. Kerins’ knowledge of, and enthusiasm for, the analysis of sound is certainly convincing. He does a fine job of demonstrating a crucial aspect of the way that contemporary films are constructed in a distinctive way. This book provides a noteworthy addition to the literature on film sound, bringing our analytical literature into the twenty-first century and teaching his readers the value of listening closely to the way films are now being made.